Google Tasks Indicator, an Ubuntu appindicator that displays your 10 most recent Google tasks on the Ubuntu panel, has been updated to version 0.0.2.2 today, and it now lets you see all the available tasks, by selecting "Show Notes" from its menu. From the "Show Notes" dialog you can also edit any existing task, mark tasks as completed, change tasks order and clear completed tasks. The first time your run Google Tasks Indicator, a new tab opens in your web browser, prompting you to grant Google Tasks Indicator access to your tasks. After this, Google Tasks Indicator should start and show up in the panel. 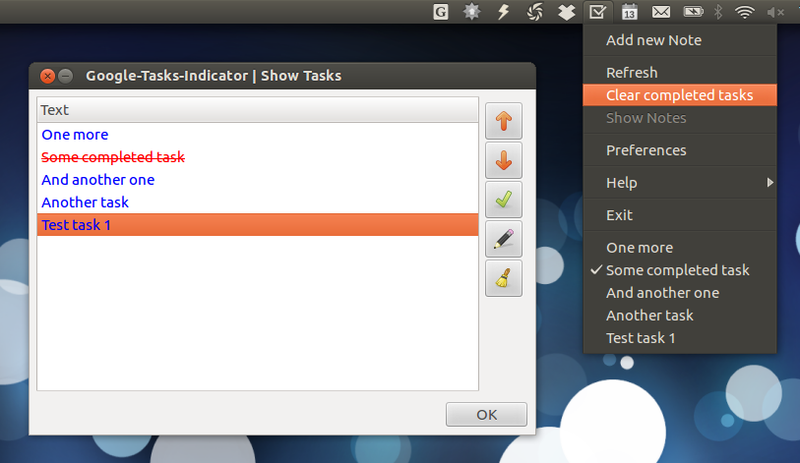 Note: I've tested the latest Google Tasks Indicator 0.0.2.2 in Ubuntu 12.04 Precise Pangolin only.